MassArt's annual Hellerstein Lecture is proud to present Regie Gibson. 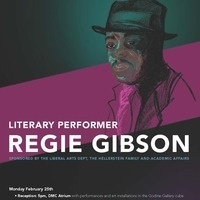 Literary performer Regie Gibson has lectured and performed in the U.S., Cuba and Europe. Regie and his work appear in "love jones,” a feature film based on events in his life. He is a former National Poetry Slam Champion, and has been featured on HBO’s Def Poetry Jam, On Point, Radio Boston, and other NPR programs. He has served as a consultant for the National Endowment for the Arts and has received both a LAB Grant and the Brother Thomas Fellowship from the Boston Foundation. He is one half of the duo Shakespeare to Hip-Hop: An education and performance vehicle combining Shakespeare scholarship and texts with jazz, blues, pop, funk, hip-hop and country music.